my property was priceless to me… then the turbine changed everything forever… Now it sits empty and sad…me too. We are waiting for the turbine contract to expire – 13 years to go, then the turbines should be dismantled according to the agreement – but we’re in Italy. A deposit was laid by that may be just enough to remove one turbine, Poggi Alti has ten. I’m hoping they’ll at least be shut down for good. I have returned to my Home in Waterloo South Australia after 2 years, to sell it, I spent the last three month, 4 days out of 7 getting it ready for sale that is the most I can but up with the Ill effects from the Turbines, have a sign, “for Sale”, but had NO one even rings to find out the price, seen people stop to get the phone number but no one has rang back to find out the price, and my Home is 3.5 km from the nearest Turbine, one of 37 X 3 mgw unites spread over 18 km ridge, if I ask people how far do they think the Turbines are from my place, most guess 1 km, because of the sheer size of them, all I can do is get my home ready and as soon as I have done with that I have to get out and see if a Agent can sell it on my behalf, don’t like my chances. I do have a problem with selling it, because I know what the Turbines can do to your body and soul, but it is what I had worked for all my life and I need to make a new start some where a long way from Turbines, after Mum past a way over a year ago I had to move out of her shed and stayed with my Brother In law, and I can’t stay with him forever, so I need to sale , to make a new start. The Massachusetts CEC (Clean Energy Center) funded study showing that wind turbines near homes don’t harm property values reminds me of the MA DEP health study that never examined anyone who lives near the turbines. The authors of the paper are located in California and Connecticut who have no experience as appraisers and, as far as I know, have never visited any town in Massachusetts as part of their research. Doesn’t it make more sense to talk to appraisers and realtors in the actual communities that were impacted? The main flaw is that the study took averages and not individual homes into account. The numbers do not tell the whole story, my personal experience selling houses contradicts the study’s conclusions. As a Realtor in this area the value of property in areas affected by the turbines has been something I have been paying very close attention to for the past two years. I know of at least five homes that would be on the market right now because some of the residents in those homes have become ill from the turbines. They are not listed as the owners don’t feel they would be able to get fair market value, soon they may have no other options. In two years only 4 homes have sold within the affected areas even though Fairhaven has seen a rise overall in home sales. There are at least 4 homes in the affected area that have been listed by a Realtor or for sale by owner, priced at fair market value, on the market an average of 190 days. This cannot be a coincidence. Why did the MA Clean Energy Center (your tax dollars at work, folks) spend $70,000 on this seriously flawed study? In my opinion to make this study more accurate a breakdown of sales in towns that have turbines is needed. Then to go one step further with a breakdown of homes within 1500 feet of industrial sized turbines. This would have given it at least some credibility. The Commonwealth seems more focused on meeting the Governor’s wind energy goals than investigating the facts on the ground. Enough with the dubious studies already. Let’s investigate the real human suffering – both financial and physical – that these turbines cause. As with realtors, every appraiser lives by a Code of Professional Ethics and Standards of Professional Appraisal Practice, violations of which can result in remedial or disciplinary actions. 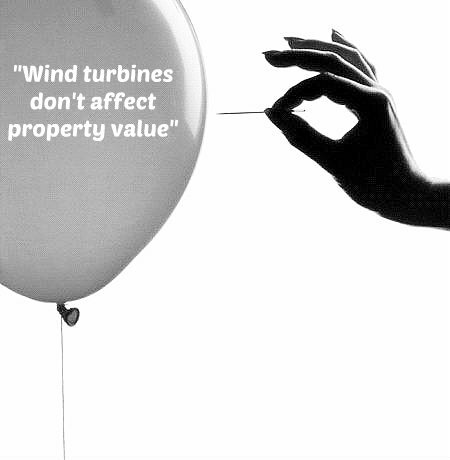 It is truly confounding to any realtor or appraiser why MACEC did not select a (or several) licensed independent appraisers to assess the property value impact to homes where industrial wind turbines were built with no regard to proximity to people or their most prized possession, their homes. Equally confounding is the MADEP/DPH’s “Wind Turbine Health Impact Study: Report of Independent Expert Panel” (January 2012). Complaints dating back several years are what initiated these “studies” and yet not one victim, those being made ill or those who abandoned their homes, were included in the studies. Also to be questioned is why MADEP (WNTAG/Wind Turbine Noise Technical Advisory Group) has been charged with “possibly” revising noise policies when the noise policies in existence are not being enforced and people are suffering because of that lack of enforcement. And, MA DPU is “investigating” so-called best practices for the siting of land-based wind energy facilities when, from the Hoosac project to the Fairhaven project, we already know where they do not belong and nothing is being done to stop the offending industrial wind turbines. I share the following, excerpted from the Realtor Code of Ethics and Standards of Practice. I have a friend in Mills County, Texas, home to one of the newest wind farms. He does closings for property sales. He couldn’t tell me how much values have gone down within view of a wind turbine because there are no sales. When someone from a city like Austin calls a realtor and asks about rural property they always ask if there is a wind turbine in sight. If there is they say good-bye and look elsewhere. NO-SALE. Several years ago I was looking for rural property in Central Texas and thought I had found the right place until I visited the property. On the adjacent property and in the western view was a very large transmission line. I said no thanks. So with one less buyer in the market for the property there is less competition and I would assume a lower selling price. Did others feel as I did? I don’t know but at least one less buyer is a fact.